DARAJ –Around his neck Yemeni businessman Shaher Abdulhak wears the Legion of Merit medal he got more than 20 years ago from the late Yemeni President Ali Abdullah Saleh. The decree that accompanied the medal lauded Abdulhak for his service to Saleh and to Yemen. The two were tight friends and remained so even after Saleh was ousted from office in 2012. In 2015 Abdulhak’s brother Bishr died and Saleh telegrammed condolences. This friendship played a part in Abdulhak’s rise from humble sugar merchant to emperor of the Yemeni economy. War, international sanctions, and Saleh’s assassination in 2017 all cut into his profits, but he managed to continue investing in cross-border and offshore companies. And despite old loyalties he adapted to new developments, forging a relationship with the new administration in Sana’a and indirect supporting the Houthis “war effort”. He almost seems out to win a new medal. Documents uncovered in a recent second major leak of records from a Panama legal firm reveal that shares of the Yemen telecom company MTN are predominantly owned by five offshore companies – and most of those Abdulhak controls. MTN paid about USD$300 million in taxes and renewal fees to the de facto government in Sana’a, led by Abdul Malik al-Houthi, in violation of international law and the sanctions imposed on al-Houthi, individuals and entities under his command in accordance with UN Security Council Resolutions. Around the time the Houthis were using cell phone technology to raise funds, according to a UN Security Council panel of experts’ report (S/2017/81) issued in late January, the company sent regular text messages to nearly 5 million subscribers urging them to contribute to “the war effort”. They were asked to send a text costing 100 riyals ($0.47), according to an official source within the company. Inside sources who asked for anonymity said MTN Yemen paid about USD$30 million to the government led by Houthi’s Ansar Allah Group in Sana’a in March to renew its license for two years. After the Houthis took over taxes collected by local authorities, transferring them to a central authority, according to a UN Security Council report, MTN Yemen paid the central bank – under Houthi control more than USD$268 million in taxes in 2016 and 2017, according to the MTN Global Tax Report last year. 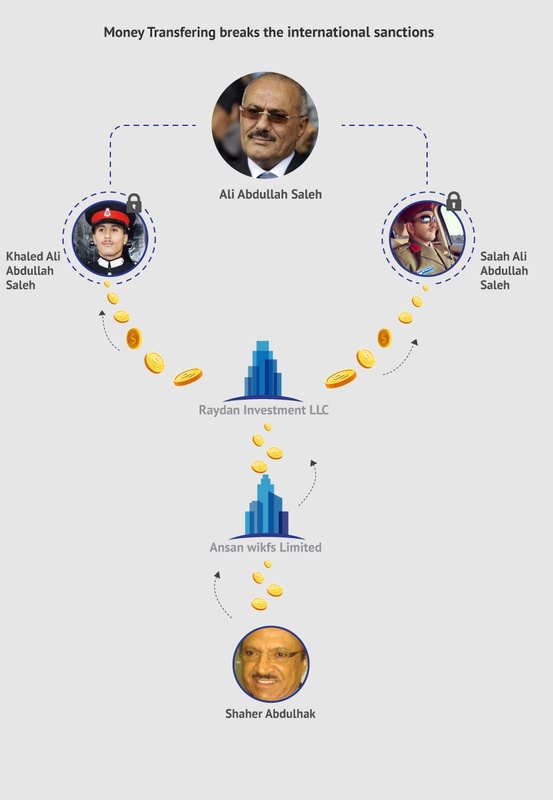 This investigation reveals continued money transfers from Abdulhak’s and Khaled Ali Abdullah Saleh’s companies, which also were included in the Security Council’s sanctions. They prohibited the flow of funds, the transfer of wealth, and the establishment of new proxies to finance military operations. The UN said all that would lead to continued fighting and more death of innocent civilians. Ansan wikfs Limited, a firm owned by Abdulhak, manages commercial projects and deals in marine and land fuel services. Registered in the Cayman Islands, the firm has transferred more than USD$3 million to Raydan Investment LLC, which is registered in Abu Dhabi. The late president’s two sons; Khaled Ali Abdullah Saleh and Salah hold power of attorney for the company. Its shares are split between Khaled Ali Abdullah Saleh who has 49 percent of them and Emirati national Zayed Ahmed Ali Abdull Daiban who has 51 percent as a sponsor partner. The United Arab Emirates does not allow foreign nationals to fully own a company. So the listed company director for the first year was a citizen, Yusuf Mohamed Ahmed al Sheikh, according to the 2017 experts report issued by the UN Security Council. The financial transfers also included more than USD$1.5 million after Ali Abdullah Saleh and his relatives were listed on the UN sanctions list. The UN panel of experts report says it could not identify business activities to account for such transfers. “The Panel has evidence that he is likely to have established that company in the United Arab Emirates as a vehicle for money-laundering activities for the benefit of designated individuals,” the report says. Thus, Ansan Wikfs Limited ignored the UN resolutions by transferring funds to individuals and entities that carried out actions that threatened peace and stability in Yemen. Ahmed Himmiche, coordinator of the experts panel, declined to answer questions from reporters about why the Security Council failed to act against Abdulhak. The spokesperson for the Office of the UN Envoy to Yemen Hoda El Turk also refused comment saying the matter did not come under his jurisdiction. ARIJ wrote to Shaher and his lawyer asking for comment, but received no response at the time of publication. But in a previous media statement, Abdulhak denied that his business was involved in the security or political situation in Yemen. That kind of entanglement would just hurt the economy and his own interests. In the early 2000s, The Yemeni government encouraged and allowed investments in the telecommunications sector. In 2001, Sapacetel Yemen was registered with the General Investment Authority to provide GSM services in Yemen. It obtained an exclusive, 15-year license to operate the mobile service for USD$10 million under the Telecommunications Act, which gave the government exclusive right to establish and operate telecommunications facilities across the republic. The government said this was aimed at encouraging investment in the telecommunications sector. The registration of Spacetel Yemen coincided with the launch of Sabafon Mobile Services Company, whose biggest shareholder is the Hameed Al-Ahmar family. He was another ally of Saleh. Other big shareholders tare he Hael Said Group and Associates, Consolidated Contractors Company (CCC), BATELCO, and Iran for Investments, according to Panama Papers released in 2016. While the shareholders of SabaFon were at the forefront, the shareholders of Spacetel Yemen and its beneficiary Abdulhak remained in the background. On May 1, 2001, Albashair Telecom S.A was established in the British Virgin Islands (a safe tax haven) with $50 million in capital. This company owned 60,000 of Spacetel Yemen’s shares worth more than $29 million, according to company records and correspondence leaked from the Mossack Fonseca law firm, in Panama. This firm provides corporate registration services in 40 offices around the world. The leaked documents did not reveal whether Albashair Telecom S.A had other partners in Spacetel Yemen. Albashair Telecom S.A’s 50,000 shares, valued at $100 each, were divided equally between two owners, Mohul Nominees Limited and Elcan Nominees Limited, both registered in the British Virgin Islands. 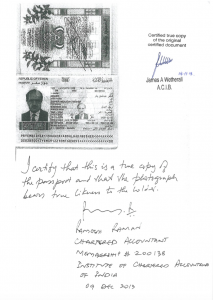 “Albashair Telecom SA continues to operate and is in good condition, with no apparent threats or problems and that the owner and beneficiary is Mr. Shaher Abdulhak Besher, a Yemeni national, and a copy of his passport is included,” said a certificate of continuation Mossack Fonseca issued at the end of November 2016. Spacetel Yemen merged with MTN Global, a multinational telecommunications company registered in South Africa in 1994 that has relentlessly worked to expand across Africa and the Middle East. To ease the way to the merger, Albashair Telecom SA at the end of October 2005 transferred all its 60,000 shares in Spacetel Yemen to Investcom Telecommunications Yemen Limited, which is registered in the British Virgin Islands, so that the latter becomes a shareholder Instead. At the same time, a new entity was formed under the name MTN Yemen, in which Investcom Telecommunications Yemen Limited owned 65 percent of shares and Starcom Global Limited, which is registered in the British Virgin Islands, owned 20 percent. Starcom Global Limited is controlled by two companies registered in the same islands, each holding half the shares: Galactic Engineering Projects SA and Vernis Associates SA, which is wholly owned by Investcom Telecommunications Yemen Limited. The shares of Galactic Engineering Projects SA are distributed amongst Hael Abdulhak, Shaher’s brother, who owns 10 percent of the shares, as well as Saudi brothers Bader Al-Zuhair (6 percent), Rasha Al-Zuhair (3 percent), and Spanish national Nadia Adham (3 percent). Investcom Telecommunications Yemen Limited owns the remaining shares. With that, Abdulhak and close associates control about 80 percent of MTN Yemen. The documents do not disclose the names of the other shareholders. This complicated map of companies’ registration and ownership, overlapping at multiple levels and benefiting a single man, raises one question: Why are offshore companies registered in tax havens although they operate elsewhere? Offshore companies are legal, but some people use them in order to hide the names of the real owners to conceal any conflict of interest. Fayyad al-Qudah, a legal expert who specializes in anti-corruption, explained that registering companies in tax havens complicates prosecution in cases where they fail to execute projects outside their country of registration. In 2015, the mobile phone license for MTN Yemen and SabaFon was terminated. Both the legitimate government and Ansar Allah or the Houthis demanded that each company pay them $30 million to renew licenses. According to unnamed sources, MTN Yemen paid $30 million to the Houthi-led government in Sana’a in March 2018. MTN Yemen and the Ministry of Telecommunications and Information Technology in the Houthi-controlled government signed the agreement to renew the company’s license for another two years until the end of 2019. The agreement was signed by the Minister of Telecommunications and Information Technology Musffer Abdullah Al-Numair and was attended by Prime Minister Abdul Aziz bin Habtour, according to an announcement by the Ministry of Telecommunications and Information Technology. An e-mail to MTN Yemen’s CEO, Raed Ahmed, asking for comment went unanswered. Both the Houthis and Saleh forces have looked for new resources to support their war efforts and to secure tribal alliances. One method was the transfer of local authority taxes to a central Houthi authority, according to Security Council experts (S/2017/81). MTN Yemen during 2016 and 2017 paid more than $268 million in taxes, equivalent to half its profits during the period, according to the 2017 MTN Global Taxation Report. Inside sources who preferred not to be named confirmed that these taxes were paid to the central bank in Sana’a, which is controlled by the Houthis. On top of that, MTN Yemen has sent regular text messages to nearly 5 million subscribers inviting them to contribute to the “war effort” with a text message that costs SR100 ($0.47). The UN Security Council panel of experts’ report revealed how Houthis exploited mobile phone technology to raise funds, using SMS messages every week. Enas Zayed, a lawyer specializing in human rights issues who lives in Amman, Jordan, said this reflects a political affiliations to one party against another in the Yemeni conflict. She adds that the Houthis are not a legitimate authority and are not authorized to collect taxes. Zayed said the role of such a company is no less harmful than that of any party financing military operations and undermining civil peace in Yemen. She wondered whether the company pays these funds voluntarily. Mohammed al-Bukhaiti, a member of Ansar Allah’s political bureau, said he was not authorized to discuss the government which is controlled by his group.